Have you heard of this card game called In-Between? If you gamble, most probably you would have played this game before. If you don't, then let me introduce you to this simple and fun game! I think I have mentioned somewhere in my earlier posts that I am not much of a gambler. I don't usually play card games and I find learning them a little confusing. But In-Between is different! It is easy to learn, fun to play and can be very thrilling! If you are like me who don't really gamble and who don't quite like to play cards, then In-Between is for you! Here's how you play the game. 1. 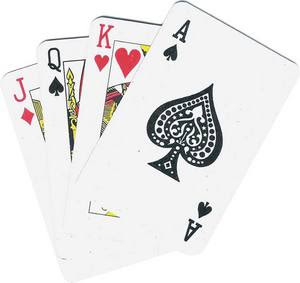 Each player receives 1 card face-up. 2. Each player is then dealt a second card, also face-up, starting from the player to the left of the dealer in clockwise direction. 3. Each player at his turn, is offered to bet on whether or not the next card on top of the deck will numerically fall between the two cards he was dealt with. 5. Players can also decline to bet. 6. If the player bets and wins, he collects amount equal to his bet from the pot. If he loses, he places his bet into the pot. 7. Now here's the killer. 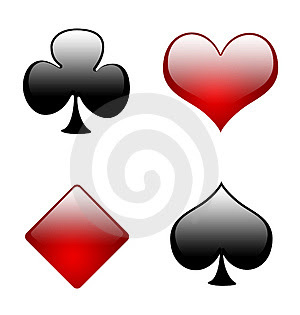 If however the third card matches one of the two cards dealt to the player, he not only loses his bet, but is required to pay double the amount of his bet. 8. The game continues until someone wins the entire pot. Well, just to understand it better, let's take a look at this example. A player is dealt 2 cards, one is a 3 and the other an 8. If he bets RM5 that the next card on the deck will fall between 3 and 8, and the card is 6, then he wins the RM5 taken from the pot. If the next card is a 10, then he loses his RM5 which will be added to the pot. However, if the next card is a 3 or an 8, he loses and pays double ie. RM10! What happens if a player receives 2 matching cards? In this case, there is no possibility of any card that can fall between the 2 matching numbers! The same goes for a player who receives 2 cards which are very close to each other numerically like 3 and 4, or 7 and 8. There's no way the third card will fall in between those 2 numbers! In such cases, the players can decline to bet. The best hand in the game is when the 2 cards are very far apart numerically like an Ace and a King. 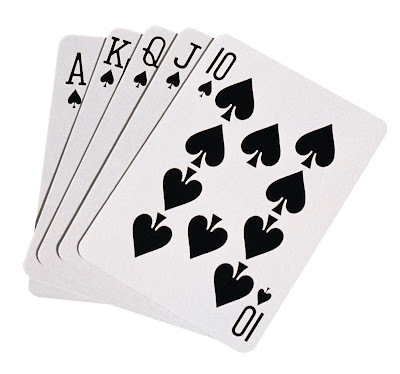 The probability of the third card falling in between Ace and King is huge! So players who receive these cards usually bet the whole amount of the pot! And if they win, they win big and the game ends. But if the third card happens to match one of their cards (and this can happen although chances are lower) then they really lose big as they then have to pay double the amount in the pot! This game can be very thrilling and nerve wrecking! I remember during the Chinese New Year last month, I played this game with my friends, we started out with a meagre RM5 in the pot. Everyone initially bet very small amounts like 50sen and some even 10sen! But halfway through the game, people became greedy and the pot shot up to RM300! I still remember how thrilling it was at that time. One friend was so confident he would win when he had cards with number 2 and King. So he bet the whole amount in the pot! Guess what? The third card was opened up to reveal a King! So he ended up paying double that is, RM600! In this way, the pot was suddenly increased to RM900!! At one point in the game, I was sweating like mad. The pot had breached the RM1,000 mark and I just received cards with number 2 and Queen. Should I? Should I bet the whole pot? I could be RM1,000 richer or I could be RM2,000 poorer!! Guess what I did? Well, I'm sorry to say I'm no gambler and I do not have the guts to gamble big. So I just bet RM200. Yes, that's the highest amount I have ever bet in my entire life! I was thinking the most I would lose is RM400. The cost of a Mamma Mia ticket! Or 4 buffet dinners at Jogoya. Or a month's supply of petrol. Or .....Oh, just do it, for God's sake! The result? The third card was a 5. Yay! I won! But not RM1,000! Just RM200. If I had been more daring, I would have been RM1,000 richer that day! Even though I won that RM200, I lost quite a bit in some rounds, so on the whole I still lost some money on that day. See? I told you I'm not much of a gambler. But you know, it's fun. This game is fun and thrilling. You should try it one of these days. Just make sure you don't turn into a compulsive gambler! These days I usually play mahjong, but very small amount. Hahha...I agree with the first comment! Have never heard of this game before. Interesting. by most elderly don't likey it cos they find it's complicated wo..
khengsiong, I am not 'lan tou' lah. I hardly gamble and this is the first time I gamble RM200. LOL! Mahjong? I'm not good in that! Very very slow cos it's still a new game to me. No one will want to play with me! Haha! nic, haha very funny! If I lose the RM2K, I will be too upset to blog about it! LOL! I have played this since young and was surprised that even folks in India and Korea know this game. Is it International? It is easy and no need use brains except good observations. Many times my friends cheated by prying into the cards before the victim's turns, so that they wanna make him poor. Very often enemies were being made over this game. You and I will understand the reasons. Wanna play together? day-dreamer, aiyo so kiasi! No good lah! Think of how much you can win! LOL! twilight zone, probably it's known internationally. Yeah, no need to use brains. Such a simple and fun game! Eh, how can you cheat by prying into the cards? Cannot allow such things lah! No, when we play this game, we don't make enemies. It's all for fun. Not so serious lah! wah, u play 'so big' ar? That said, this in-between is quite interesting. I want to play chor dai di now haha (wonder if I spelt that correctly lol). I love card games! My favorite is poker. I haven't played this game before but it sure sounds interesting. I'm not a gambler either. I just play for fun. I’m not much of a gambler mainly bcoz I hate losing money like that. i'm kinda stingy and i don't risk enuf to win anything anyway. I don't know how to play many card games, only Black Jack and that is with my relatives and some friends. We don't bet money, just for fun. lina, it's not complicated at all. This is a very simple and fun game. Oh, yeah I forgot you are not supposed to gamble. Hehe. mei teng, oh I play board games too but very seldom play nowadays. Which board games you play? life ramblings, yeah me too. I don't feel it's worth losing all my money like that! Or should I say all my hard earned money! TZ, you won 5K in 2 hours? OMG! Is that Malaysian ringgit or Ugandan currency? Looks like you have talent in gambling! Haha! I'm not a risk taker (well it's different in business :P) so I don't gamble. I only gamble in soccer which most of the time, luck always on my side. The biggest amount I won in last Euro Cup was only RM600. Live with "if" is dangerous. Ask STP. LOL. ahh...I pusing pusing blurr ledi! When I went to Las Vegas many years ago, I walk around the slot machines and play each one time. I don't stay at one slot machine. I won $250 doing it while my husband who played poker in one machine didn't win anything. :o) I always put a limit on the money that I will spend on that trip and when I reach that amount, I stop. I am not quite a gambler too. I think the biggest amount I ever lose in less than RM50. That was in Genting playing the coin slot machines. I never sat around a table in Genting. I would rather lose my money traveling elsewhere! Wanna join my China trip this August? Drop me a line if you are interested. I am currently 'recruiting' fellow bloggers to join me, haha! faisal, it's good you don't gamble. I really think we should not gamble. But excuse me, gambling in soccer is also gamble. So much for not gambling! LOL! babette, so you have the gambling luck in you whereas your hubby does not. Haha! I never win in gambling, that's why I don't fancy gambling! jam, yeah better spend your money on travels. More worth it than gambling away your money, right? Playing card is the game long time before! we loved play a game named "finding friends", That's a kind of funny game which can allow many people enjoy together, but can't gamble. Miss the days of "finding friends". iWalk, what is "finding friends" game? Never heard before! Why can't you gamble? sounds complicated :-D oh well..I don't gamble anyway.. I only gamble during Chinese New Year and only play black jack. This year no luck, lost some money but is ok because the money went to my nieces and nephew. i just laerned to play this game during last cny.. :D quite nice too..
xin, I am a lousy drinker. If I play this game using using liquor instead of money, I'll be out in no time! LOL! Wooo, gambling is addictive... better stay away from it lorrrr! wow this game is fun. I will surely suggest this game the next CNY! Thanks for your detailed explanation!!! tekkaus, you should try this game - it's really fun! I didn't bet RM2K, only RM200 - didn't have the guts! LOL!